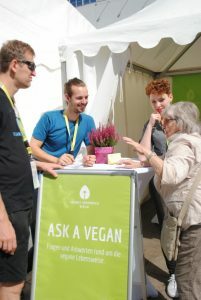 After the great success and positive feedback last year , you can once again find our ‘Ask a Vegan’ booth again at the Vegan Summer Festival this year. 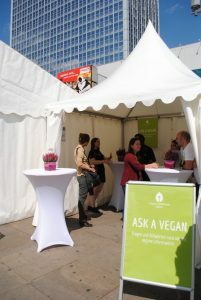 The booth is the place at the Festival where visitors can ask vegans any questions they might have about a plant-based lifestyle. Who stands at the booth? Vegans who want to give non-vegans more information about plant-based living. 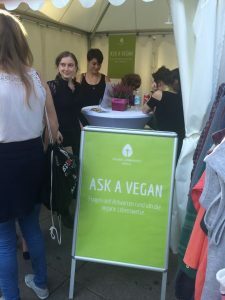 Some are already active as vegan buddies, whole others are just everyday vegans who live in Berlin. What does the booth offer? Where can I find the booth? 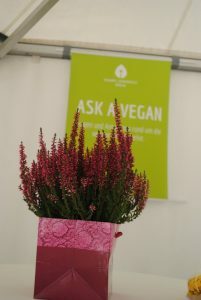 The ‘Ask a Vegan booth’, as well as the stage, the lecture tent, the bouncing castle, and the children’s tent, are organised and supervised by the Orga-Team of the Summer Festival.